I try and get down to The Elephant at least once a year as it’s the closest Michelin starred restaurant to my home (approx. 2miles), I like to go down around May as “The Room” the fine dining area of the restaurant re-opens from its winter shut down. 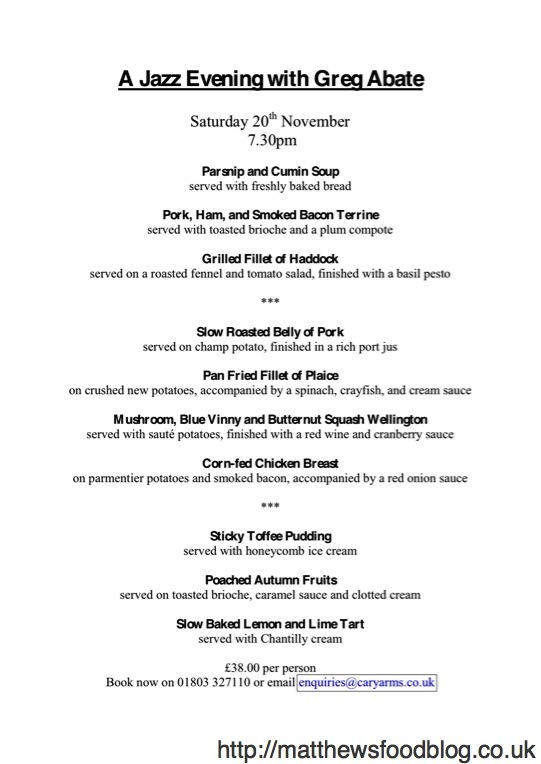 Due to the re-opening “Simon Hulstone” (Chef) makes a new and exciting menu, including a new tasting menu. The server was very polite and showed us to our table right in front of the main window, with an absolute gorgeous view over Torbay, if only the weather was as fabulous it would have been perfect. Bread was then quickly served, this consisted of a duck rillette with crispy pork, hummous, butter, green and red olives and olive ciabatta bread. All of this was very good, the bread was good and warm and the butter very good. Also with the bread some locally foraged ceps/mushrooms were provided, these were picked by hand up at Haldon Forest. I have to say I wasn’t too keen on these and found there wasn’t any distinct flavour, or mushroom type flavour at all. Next a chilled Amuse Bouche of vichyssoise with cubed apple and candied walnuts. This was really nice with a creamy taste, the sweet walnuts were a very good addition also. Next came the crab dish, this was accompanied by “Brown Crab Toast”, upon tasting my dining partner instantly declared “they should just sell these!!”. She was correct as well the outer “toast” was extremely sweet and matched beautifully with brown crab. The white crab meat was lovely, and the pea panna cotta underneath matched really well, the sorbet tasted alone had a very distinct flavour and wasn’t to my taste, but when matched with the other elements it worked perfectly. Next was the Scallop dish, this was a very well put together dish with the bowl being piping hot when served. The flavours were very distinct and clean, with only 2 main elements it was very pleasing, the seeds only added to the slight sweetness of the scallop and prince purée. The Brill came next, now this dish was my favourite of the whole evening. The fish was perfect, with all flavours coming through but the star for me was the verjus and spring onion butter, this was very sweet and for my big sweet-tooth made for the perfect dish. The small balls of spring onions which had been made I can only imagine with a mellon baller, shows the attention to detail here. Next came the lamb and chicken, this dish to me was slightly disappointing. The lamb was gorgeous with it being cooked just as I liked, but I found the chicken just didn’t add anything to flavour, I think I would have preferred there be just lamb here with no chicken. The side elements were all good with the flavours showing and the garlic added a lovely after taste. 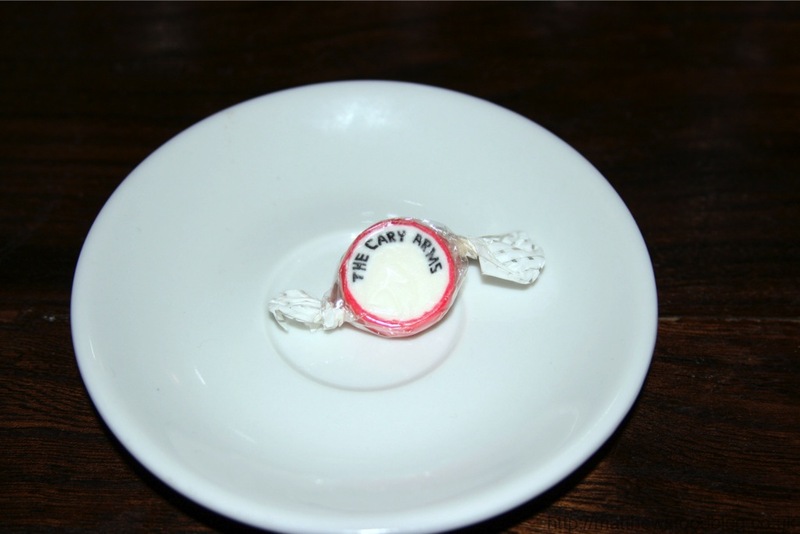 Now for my best bit of any meal….. Dessert! This was the strawberry dessert and was served plain and then the jus being added at the table. The sphere itself was a beautifully light strawberry moose, with an added surprise of popping candy throughout. It all worked well and the centre of the moose had a small ball of cream which really added a nice flavour. The whole dish was so light and refreshing. The centre of the “Fondant” was a strong butterscotch type caramel, however this was a very thick centre, and I would not call this gooey/liquid. Now this asks the question “what is a fondant”, does this really class as a fondant having a quite solid centre, or more of a caramel centred moose? I’ll leave that up for individuals to decide, however all I know is that it tasting in a word “lush”. Well that brought the meal to the end, we were asked if we wanted coffee, however we both declined as we are both not coffee drinkers. 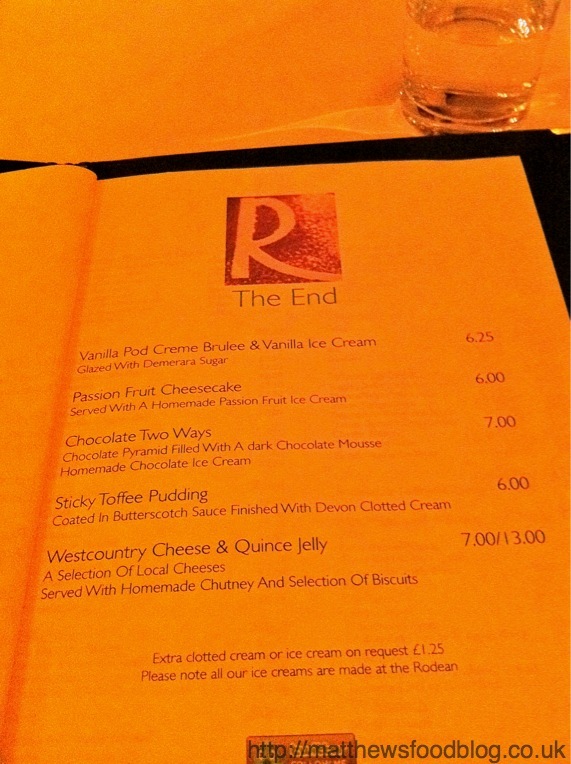 The bill was then served with a nice stick of rock compliments of the restaurant. 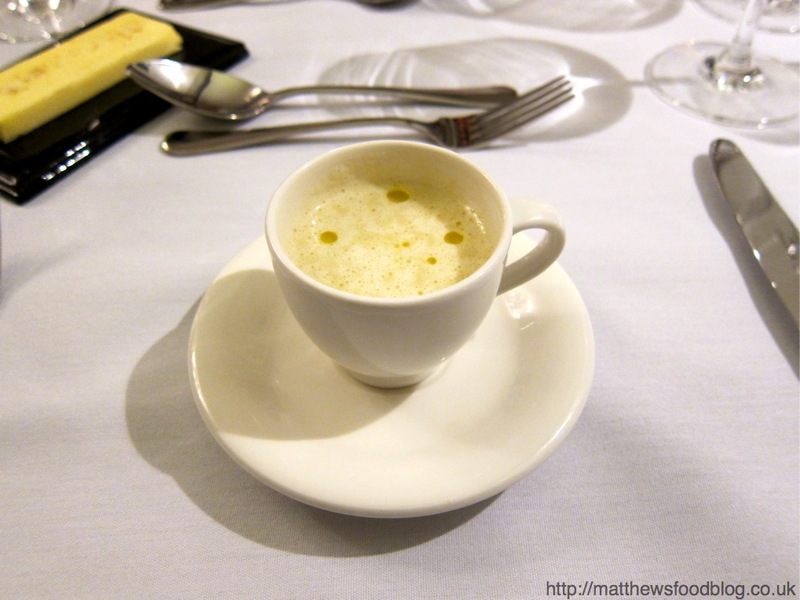 However we were both slightly disappointed as the tasting menu included coffee/tea and petite fours, although we declined the tea/coffee, no petite fours appeared. After settling the bill, I then asked to have them which the waiter politely and kindly said he would go get from the kitchen right away. 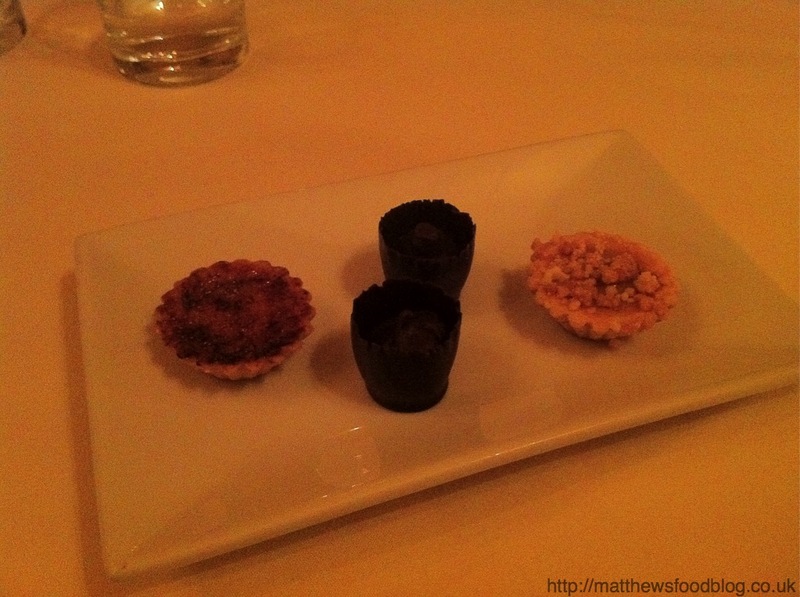 Petite fours were then served, being a strawberry macaroon, orange jelly, chocolate fudge and white chocolate truffle. 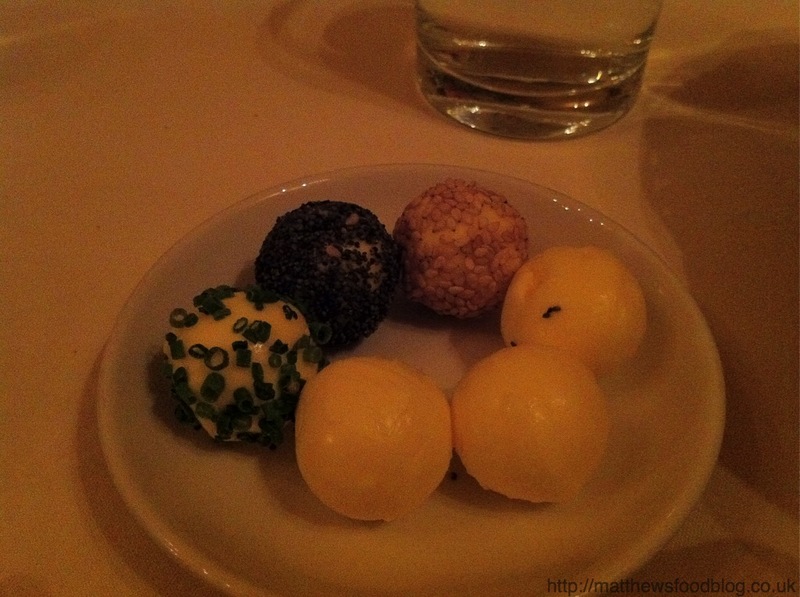 The favourite for me was the white chocolate truffle, it was smooth and creamy and had a great taste. Also which was great was that there was 2 of each item, so we could both sample each one. We both really enjoyed our experience at the Elephant, the food was clean, well cooked and executed well. There seemed to be a rolling theme throughout the entire tasting experience and that was sweetness, which to my personal taste was my dream menu, however this might not be to everyone’s taste. 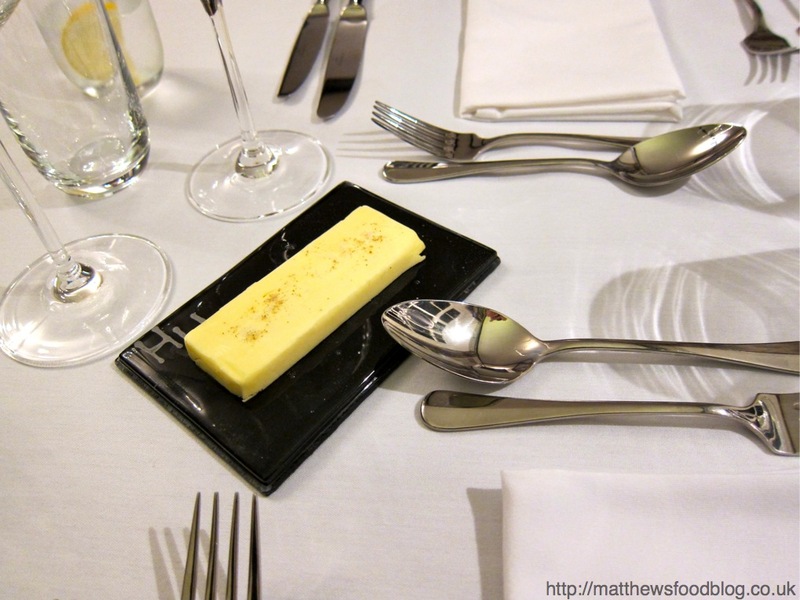 There was only a few minor issues of the evening, but they didn’t really distract from an overall good meal, it would have been nice if the petite four experience had not occurred, but something which can be forgotten easy enough. 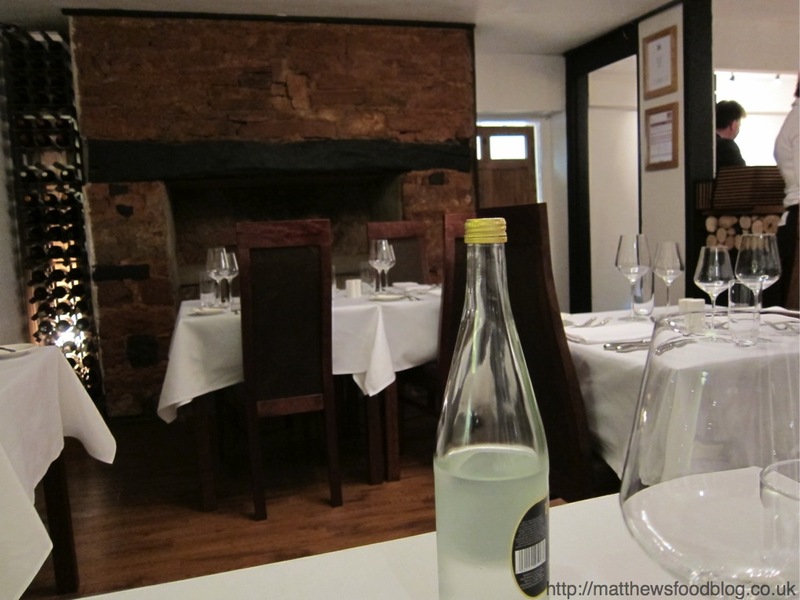 I now only want to return and have the À la carte version of the brilliant Brill dish! Cant wait to return! This restaurant originally opened in 1989 only 3 years after I was born, my parents actually had one of the most important business meals of their careers one evening here many years ago. Austrian rooted “Werner”, the owner then closed the doors of Old Vienna in 1991, but since then reopened at the same premises in 2011. Due to his Austrian roots, this reflects in a major way on his menu with sauerkraut, schnitzel’s and many other Austrian delicacies having an influence. When we entered the restaurant, “Werner” the chef was waiting at the bar to greet us, it seemed that on this Wednesday evening he would not only be our waiter but chef as well. This originally scared be abit thinking we would be ignored, but I can gladly say by the end of the meal I was pleasantly surprised how well this worked, ill explain more about that below. Bread was quickly served which was lovely and warm, this bread which is home made was lovely. The flavours were so mixed with a hit of paprika, garlic and many other herbs, it was quite dense and doughy, which when accompanied with lashings of butter was gorgeous. I was then then served “Grilled Goats Cheese on Garlic-brushed Bruschetta with Vine Tomato and Basil Concasse“, immediately I was surprised by the size of this, it was a very generous portion. This was one of the most gorgeous goats cheese starters I’ve had at a restaurant, the dressing which covered the salad leaves etc was so very sweet and paired great with the cheese. Everything on the plates matched well, looked great and tasted better. Now while waiting for the mains to arrive obvious “Werner” was busy away in the kitchen, and while my table was chatting away we were all of a sudden shocked to hear yodeling…… Yes yodeling coming from the kitchen, it seems this chef used to have a past role in the “Generation Game”, needless to say “Werner” took several breaks from the kitchen on the evening in question to chat to us all, and he really is the life of “Old Vienna”. After a lot of laughing, chucking and interesting conversation with the chef we moved on to my main which was “Roe Deer Steak on a Carrot and Potato Cake served with sautéed Wild Mushrooms”. This dish again was great, served as requested “Rare” and the mushrooms going great with the deer. 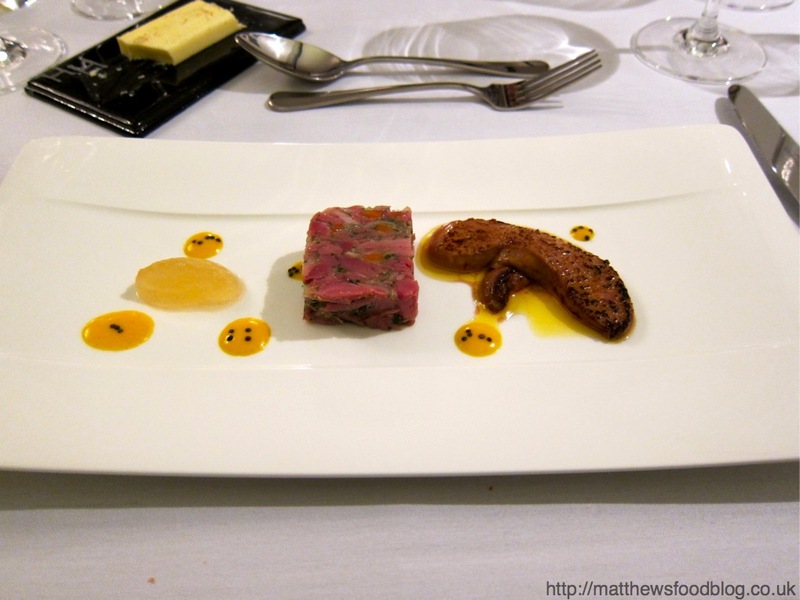 I was pleased to see that the portion was not in line with the large starter and was well proportioned. This was served with a selection of vegetables such as Carrots and fennel seeds, Beetroot with Horseradish and a few others, roast and chipped potatoes were also served. I don’t think the additional potatoes were really needed, as each main already comes with a carb element such as my Carrot and Potato cake, which was great. Now on to the best part of any mean….. dessert! I had to order the “Linzer Torte – Austria’s answer to the bakewell tart” just to say I had sampled something really Austrian at an Austrian restaurant. This I can only describe as a very “almondy” almost marzipan tasting sponge, with a blueberry jam filling…… it was heaven. The sauces added to it, however I don’t think the mango was needed as it had a sharpness which was just abit too overpowering. Werner really is the star of this establishment and spent a good further 45minutes after our meal, sharing stories and his past experiences. He makes the service personal and relaxed, however I am glad that on busy evening he has a waitress who assists him, as I’m sure if he didn’t have help everyone would miss out on his great entertainment. 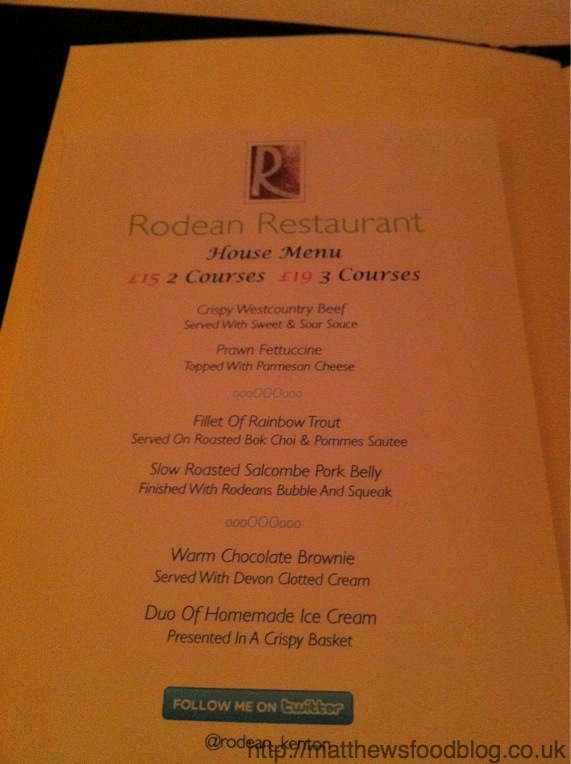 This was a superb meal, I would no way hesitate to recommend close friends, or infact anyone I know to pay it a visit. When you do just make sure to listen out for that faint sound of yodeling….. an experience not to be missed, both for the chef and for the food! This small establishment is based right in the Town Centre of Torquay, just above the main high street. From the exterior it is minimalist styled and unless you were looking for it, you would pass it right by as the front is the same size as all the other shops/operations which are on this street. They advertise them selves as an authentic Italian restaurant, for me this instantly gets shudders of fear in my bones as the thought of deep pan pizza’s, pasta which is saturated in sauce and watery minestrone soups instantly comes to mind. 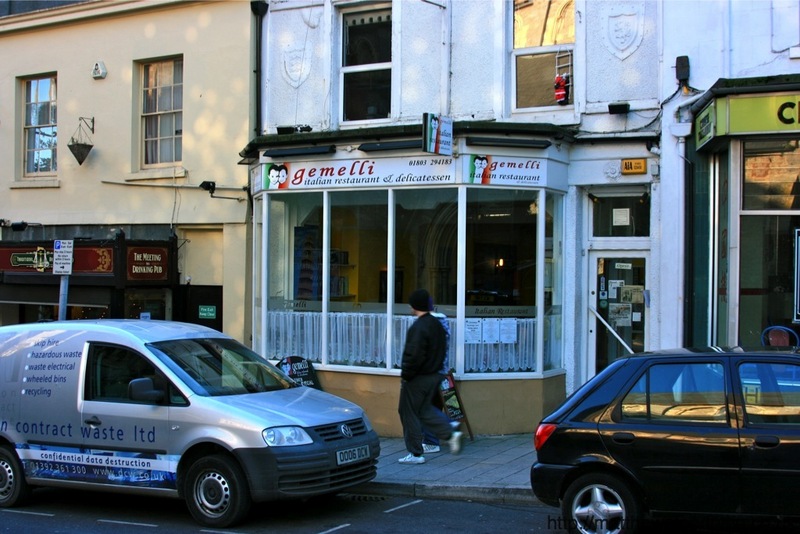 The owners of Gemelli’s are a complete family team with Lorenzo being based in the kitchen and his wife as head front of house, this is then combined with the kids staying upstairs which im sure are the future chefs of the establishment. The table booked was for Wednesday lunch time at 12:30, upon entering the restaurant I was slightly disappointed to see the place completely empty with no sign of life from owners/staff or diners. I guessed this was due to the pre-christmas detoxes and everything else going on, however standing waiting in the room, still no life was to be found to show us to our table or anything, I decided to take a look around the the Deli counter which has a very good range of items. The small glass windows shows various marinated olives and vegetables, a good range of meats and also a wide range of cheeses. Now at this point over 3 minutes had gone by with no sign of life what so ever, 3 minutes on paper seems no time at all, but when you are waiting for something or in an awkward unknown location it can seem like a life time. At about this time I thought that was going to be it, but then I noticed by the door entering the restaurant a small bell and upon banging the dong, the head of front of house immediately popped out and offered a very warm welcome. 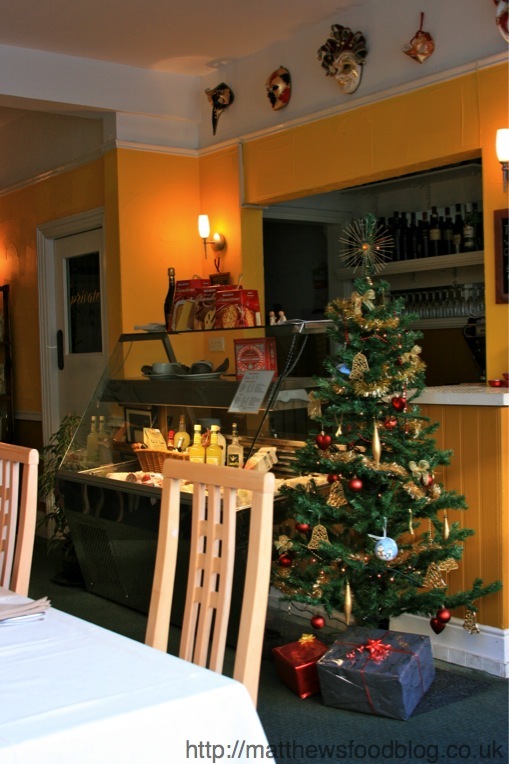 She was very friendly and kind to talk to and made you feel immediately at ease and due to being the only ones in the restaurant this was needed, we were shown to our table at the front of the restaurant with the large windows allowing you to people watch and the goings on outside. The tables are all cleanly dressed with white table cloths and glasses and cutlery placed, with small flower pots placed around. 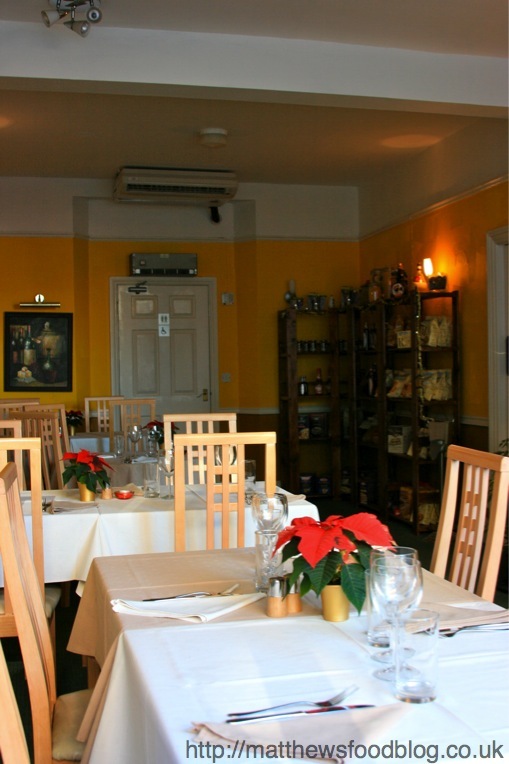 The entire dining room is airy, bright and offers a lovely calm atmosphere even at this time with few people around. However on this occasion I really fancied having the goats cheese starter which was on the evening menu, Lorenzo was more than happy for my to not go off the lunch time menu and switch to the full evening menu instead. The menu is a great mix of authentic pasta dishes combined with a mix of main courses which suit most tastes, also due to the nature of the chef/cooking he is happy to alter these dishes to suit other tastes or preferences. 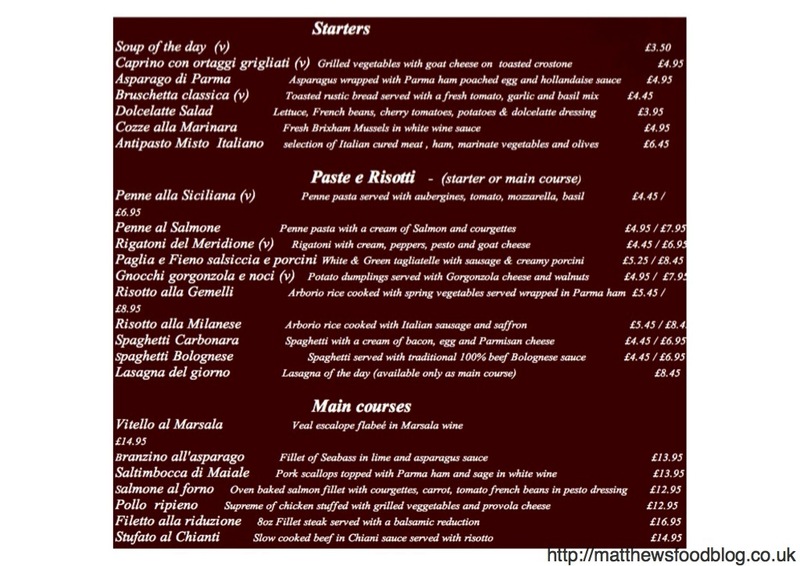 There is also an extensive pizza menu here which has all that you would expect to find. 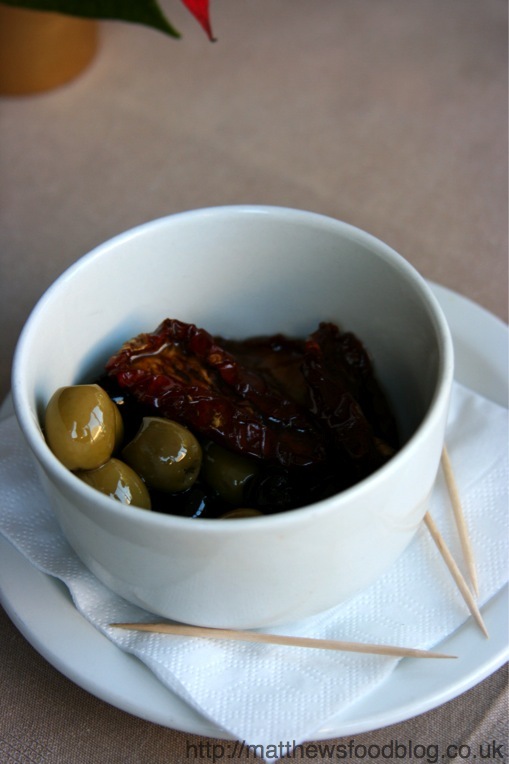 With orders taken a small pot of olives and marinated sun dried tomatoes was placed on our table with small tooth picks, these were lovely and fresh and offered a great light snack to prepare us for our meal. I am always surprised when Italian restaurants provide you bread and oils as a pre starter, as most of the starters/mains are carb based pasta and with this added bread it is just so easy to fill up too quickly and become bloated. So this was a nice alternative and allowed you to snack without the concern of being to full to get through your main. When presented with the dish I loved how it was very rustically styled on the plate, with the produce not trying to made into something that they shouldn’t be. Everything could immediately be identified on the plate and simply sampled without the need to go routing through the dish to find that certain flavour. The toasted bread was lovely and had a light helping of oil, which was added to by the grilled vegetables which were lavishly coated in a very good olive oil. The large disc of goats cheese atop of the stack of bread and vegetables was gloriously gooey and melted on the outer edges, with the centre still having a good texture to it. The cheese was extremely rich and had a slight hint of salt at the end of the palette which I did enjoy, particularly pleasant was the use of the oil and pesto which was actually melted into the cheese and provided such a great mix of garlic and herb flavours infused into the entire slice. With all the flavours combined of the stack this made for a fantastic dish with the oil providing just enough moisture to compliment the cheese. The small added salad was used well to provide a slight crunch to the entire dish and lightened the dense cheese. Now due to the fact in my past experience of Italian restaurants it seems no matter what you ask for when you order a dish of pasta, not only do you get an extremely large and deep bowl, this bowl is usually piled high with dense filling carbs which is one of my pet annoyances when it comes to UK italian restaurants as it is so just too filling for one person to eat. So with this in mind I decided on asking for a starter portion for my main dish, knowing that this is normally what I consider a main dish size. When Lorenzo brought this to the table I must admit, I let out a sigh of relief as not only was the portion perfect but it was served on a plate and not in a deep bowl. The presentation again was very similar to the starter, being very rustic and having that home style cooking look, with all items being simply found and no frills added to the plate, the only addition being a slight sprinkling of parmesan cheese which had already started to melt into the pasta. On first taste I was very found of the seasoning which was perfectly balanced with the salt levels being on a very even level, which with the use of Italian sausage I normally find is a little off in these types of dishes. The sausages added a lovely element to the dish with a great taste and a different texture to the pasta which was tender but not to hard, I would describe it as just have a “bite” and I was still able to easily wrap it around my fork. The main praise here however is the perfect portion of sauce used, there was no cream dripping from the stands of pasta yet it just coated it lightly and allowed for all the flavours to merge together without feeling like you were eating more of a stew than a pasta, which again I found it alot of Italian eateries the sauce is outweighing the actually pasta portion. 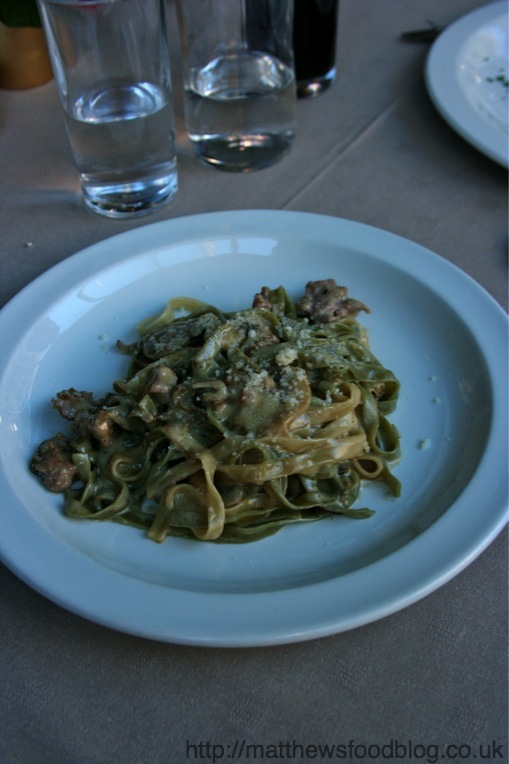 I loved this dish and found the whole mix of sausage, earthy and juicy mushrooms and the perfectly cooked pasta a fantastic combination. Having now fooled my mind into thinking that i’ve only eating 2 small starters I immediately set my eyes on the lovely dessert menu. 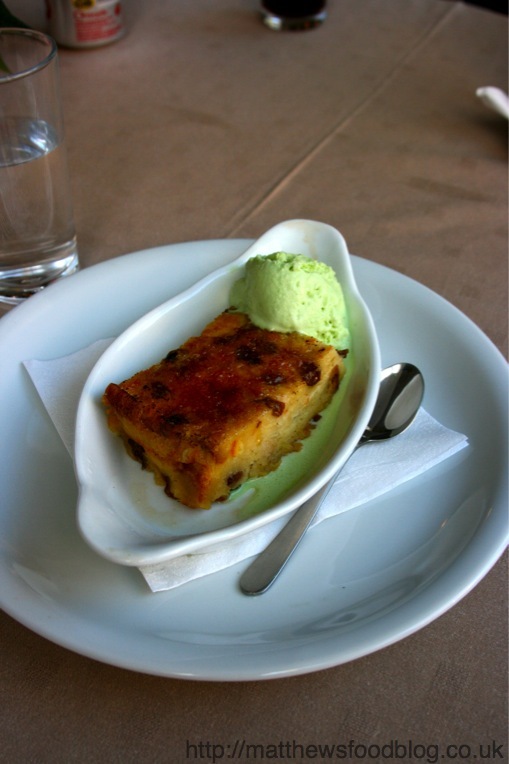 Unfortunately Lorenzo informed me that he was still making his Tiramisu so this was off the menu, however upon seeing the words “bread pudding” the thought of this stodgy dessert had my excited. Again Lorenzo was kind enough to bring this dish to the table him self, and it was a lovely portion size with the pudding being a good 2×4 inches. When I started tucking into the dish my immediate surprise was a Brulée type topping with sugar which had been glazed/burnt ontop of the bread to form a sort of gorgeous crunchy topping, this provided a sublime change in texture from what this normally stodgy dessert provides. The panettone was great quality with juicy raisins and different fruits place densely throughout the entire section, the desert was served quite hot but not steaming, this was a nice touch as this allowed for the ice cream to start to slowly melt and not just form a pool of liquid immediately. The ice cream was very good and had a good flavour, however it would have been nice to actually find some ground pistachio pieces in the ice cream but this is of personal taste. This has got to be one of my favorite puddings of recent, the whole rustic no frills serving style is brilliant and allowed you to enjoy exactly what you saw on the menu. I really enjoyed my lunch at this small Italian eatery, and have very very few complaints here. The food was all sublime with everything cooked, tasting and feeling fresh and not pre-prepared, the flavours and combinations used provide for a great authentic Italian experience and the whole in house family team only add to this. The service was also very good with everyone being pleasant and talkative without being to in your face etc, also it was very good service to be able to have 3 freshly cooked courses in the space of 1.5hours and can only praise Lorenzo for this. The value is excellent as well with my entire meal costing between 15-17 pounds with water, and considering if I did have a main instead of a 2 starter portions this would still be under £25 per head, I think this is good value for money. My only mine gripe being here is the lack of welcome upon entering and it would be nice to see someone permanently outside in the main dining area to great you, or a sign next to the bell asking you to ring to get attention would be nice. I would recommend this place for a relaxed lunch for families, or would be fantastic for a close romantic meal for couples. I have since returned to this restaurant as I enjoyed it so much and I am ashamed to say had exact same dishes as previous, this in my opinion is only a praise for the cooking as I enjoyed it that much. 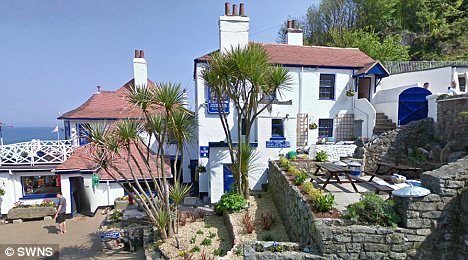 The Cary Arms has been a firm establishment set in the history of Torquay for many years, it is set right on the beautiful beach of Babbacombe. Years ago it was more known for a Summer drinking location which serves your standard pub grub, and would be a place to go for your sunday afternoon drink and then attempt to stumble up the HUGE! hill, which it has also become known for. 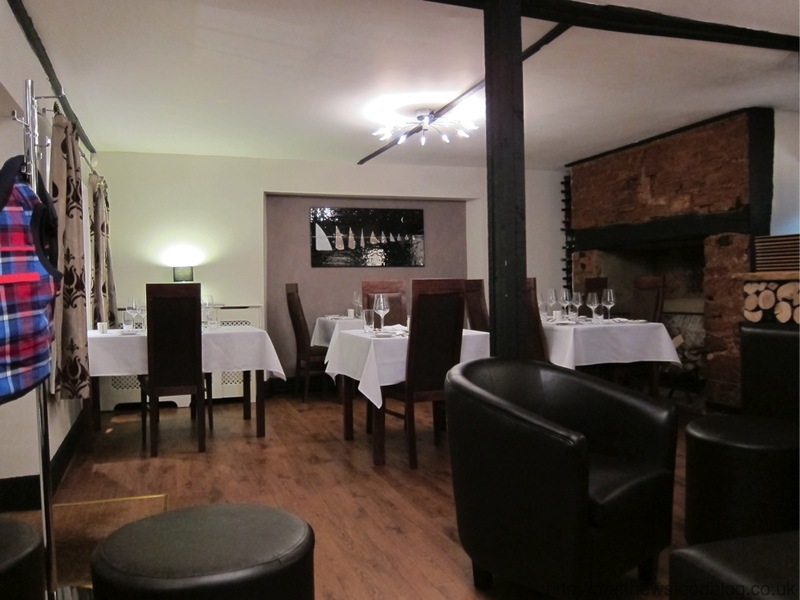 The restaurant was re-launched 18months-2 years ago, since then it has been becoming more and more known as a Gastro-Pub style restaurant serving fine dining in a calm and relaxed environment. 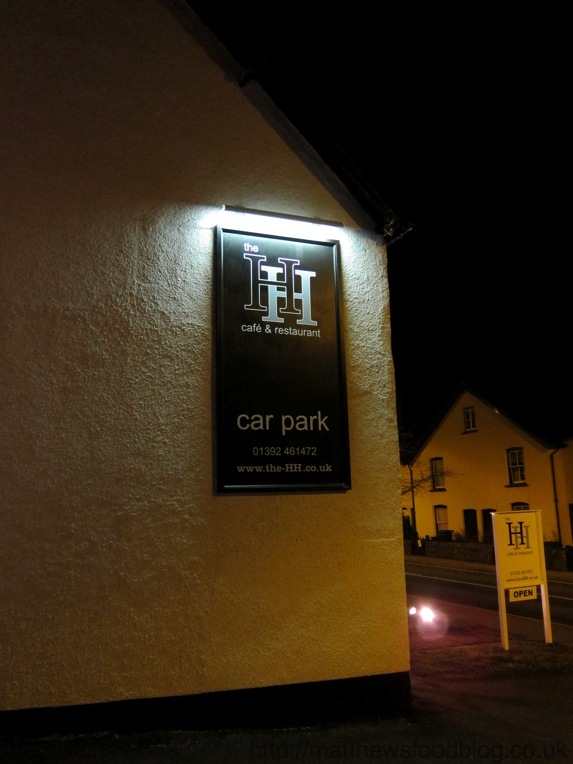 This has been shown only recently when at the start of November (2010) it was awarded “Gastro-Pub Newcomer of the Year” from the “Top 50 Gastro Pubs” association. Having seen this award was given and hearing from a few people different reports, I had it set in my head that I must get down as soon as possible. 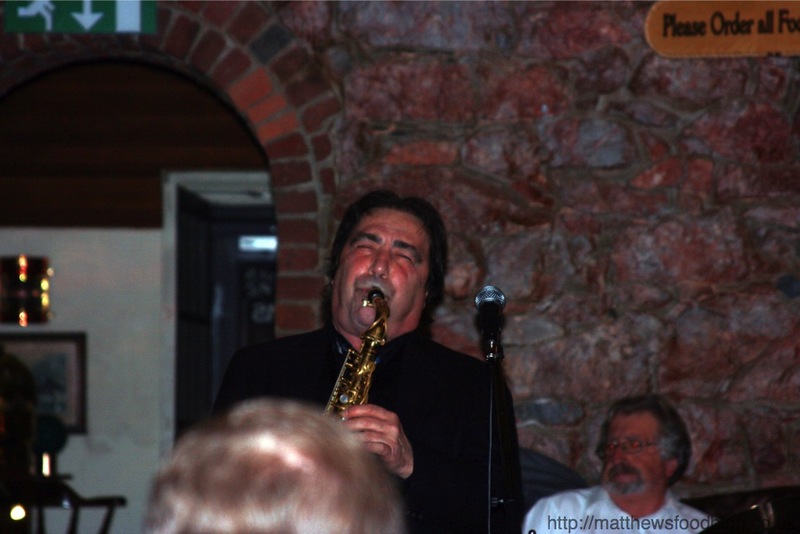 My chosen evening however they had a special event on, with the famous saxophonist “Greg Abate” playing and a special set menu was to be served. Considering that this would be a special event I thought this would be a great chance to get down and try out some of there offerings. Unfortunately the Saturday evening turned out to be wet and absolutely freezing, and leaving the house to walk to the pub I was really questioning should I go……. However being brave I wrapped up and managed to get to the start of the long and STEEP hill down to the pub, at this time both myself and dining partner was questioning the worthiness of such a trek. After much complaining and “sighs” we both started down the hill avoiding the extremely slippery drain covers, by the time we made it down we were both absolutely freezing. Upon walking in to the pub we both have never been so delighted with the pub absolutely glowing with heat, the internal wood surfaces just giving that feeling of warmth. 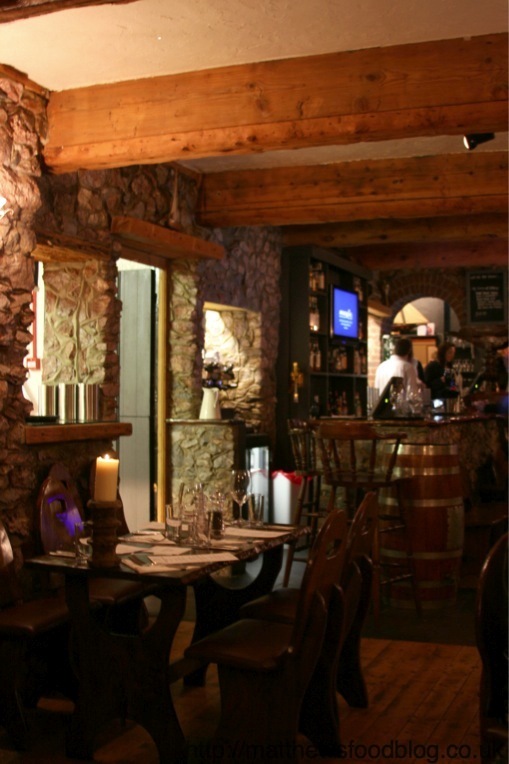 Upon entering the pub it is very inviting with a good sized bar stretching right the way through the main restaurant,with seating located both around the bar and in the restaurant area. The area is very relaxed and not pretentious at all, it puts you completely at ease with small sea-side nik-naks dotted around, the atmosphere it creates is very relaxed. The waitresses are all young and dressed in relaxed clothing, with jeans and hoodies/sweaters with “The Inn On The Beach” printed on the back, again adding to that relaxed feeling. Due to the dress and their mannerisms they are incredibly approachable, polite and create a chilled out atmosphere the pub is aiming for. 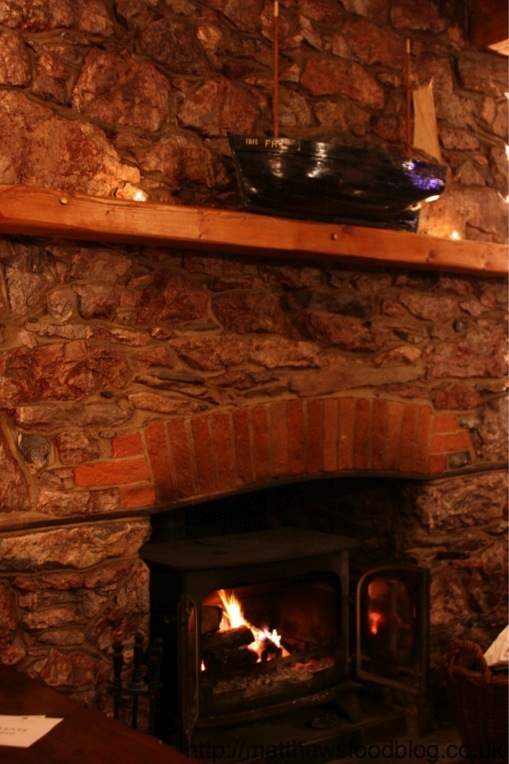 Having now being seated at the back of the restaurant, near a great wood burning fire crackling away, we were very happy to warm up from the walk down the hill earlier. The tables were very solid wood, with wooden benches/chairs used. I will not comment too much about the entertainment on the evening but suffice to say the band was incredible with Greg being a particular delight of the evening, the staff had managed to positioned all the tables to allow for everyone to get a great view as well which was a great plus. 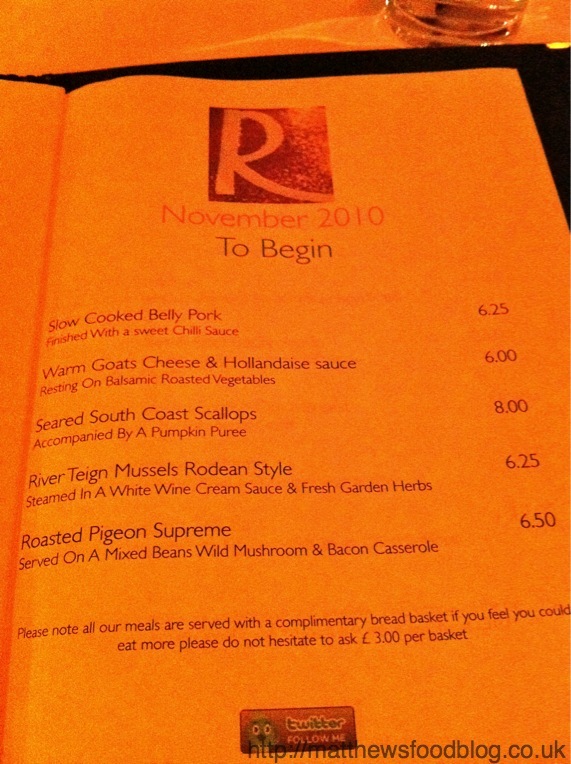 The menu was then presented to us, which on this evening was a set menu priced at £38 and formed of 3 courses. The menu had some really tempting choices and with only 3 starters and 4 mains, it took me a good time to finally come to my decision. The style of cuisene was really pushed towards classic/modern british, with famous classics you would expect such as belly pork, chicken breast and the famous sticky toffee pudding. The young lady waitress kindly took out orders and as the band began to play, I suddenly realised that no bread was insight and then it dawned on me that we had no bread plates……….. my heart suddenly skipped a few beats as this is normally what I look forward to the most in these gastro-pub style places. I know they say simple things for simple people but something about that still steaming soft chewy homemade bread with lashings of butter just makes my spirit lift! After 15mins myself and dining partner finally came to the conclusion that no bread or amuse bouche would be appearing tonight. Immediately this dish jumped out at me due to the stunning colours and how everything jumped off the plate, even the neutral colours of the Brioche and terrine blended so well with the great glossy dressed salad, and stunning blood red plum compote. The brioche bread was lovely and soft with only the slightly of toasting on the outside of the slice but with a good crunch in the crust, it had a great sweet taste and this melded very well the other elements of the dish. The salad was your standard mixed leaves with a light olive oil dressing, standard item really here but were fresh with a good bite and the olive oil added the needed texture to the item. The terrine it self was excellent it was served ice cold, but was not too loose and allowed for a good slice to be cut away from it, due to the lovely amount of bacon rind wrapped around this the flavour on the outside was gorgeous with a strong smokey flavour. The ham in the terrine really did have a kick and could easily over power many items, however the plum compote worked so well with its sweet plums it added such a wonderful additional element and I just couldn’t get enough of this. I really did enjoy this starter, to a point I would travel down the enormous hill just to pop in and grab this as a light lunch. I am still foolishly aiming to keep trying different out of my normal comfort zone dishes and avoid the usual selections I make, such as the Belly Pork or Duck etc etc. When I saw this item on the menu I thought this would be a good chance to swing away my normal narrow minded selections and for once step into the dark dark corners of vegetarianism. Again the dish was presented well with the wellington being not as I had expected. In my head I envisioned a large cylinder of puff pastry, and inside would be many chopped mushrooms with tones of cheese, then a small touch of butternut squash, this would be served as a single slice on the plate. However what was presented instead was a more refined dish with a large portobello, placed atop a thin slice of butternut squash and then a very small amount of blue vinny cheese placed on the mushroom, all wrapped in puff-pastry. The puff-pastry was the first element to be sampled, the top pastry was incredibly crisp and airy, with the layers all giving different flavours due to the mushroom and cheese leaking into the internal layers. The base was very soft and soggy, but being the heathen I am….. I loved this as all the flavours had soaked/absorbed into the pastry and seemed to have the most intense flavour! The mushroom provided a great earthiness when combined with the strong cheese and without this, the cheese would have just been too overpowering. The whole wellington worked well apart from the butternut squash which I found the flavour didn’t really come through in the dish, this element was not missed though and if it was not named on the menu I would have said it was not needed. 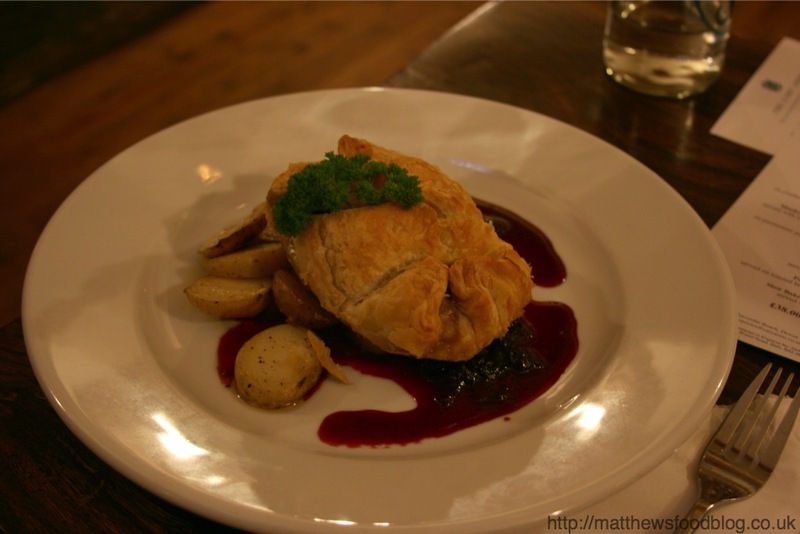 The cranberry sauce was great with a really sharp acidic taste which complimented the wellington well, and worked well to lift the entire dish up in terms of strong flavours. This dish was also served with your standard side dish of buttery vegtables. The dish all worked well and every element from the internals of the wellington to the sauce and side veg, all seemed to blend exquisitely. Now comes the favorite part of any meal for myself…… dessert. I was brave again here and resisted the urge to go for that good old favorite sticky toffee pudding and pushed those voices in my head aside and decided to go for the “heathy” option of a tart (I think I actually fooled my head into thinking this was healthy to get away from the pudding!). I was immediately impressed when served the dish by the size of the slice with a large spoon of Chantilly cream with a raspberry coulis. The tart it self consisted of the main filling being very well set and great to slice with the edge of the spoon, it had a great strong lemon flavour but being sweet at the same time with no element of sour at all. 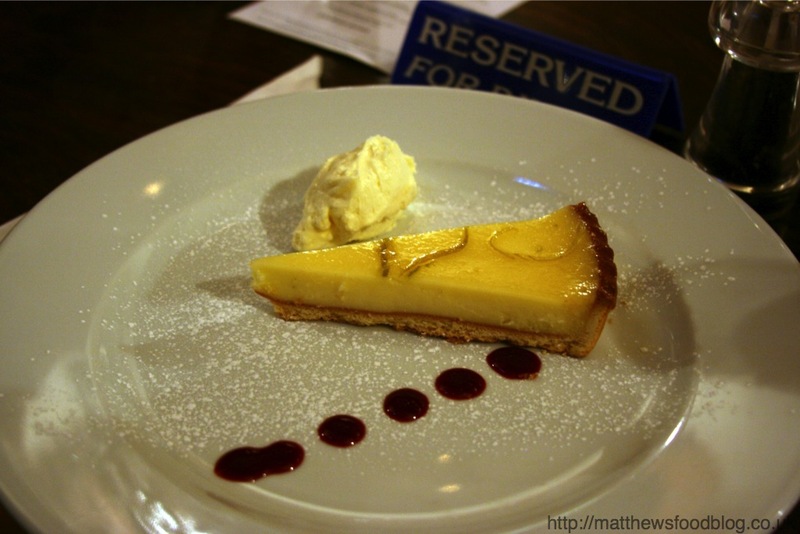 The topping was a lime jelly with strips of lime rind spread throughout the topping, this added a very strong sour kick to the dish and would be slightly overpowering if it was not for the tart pastry being very sweet. 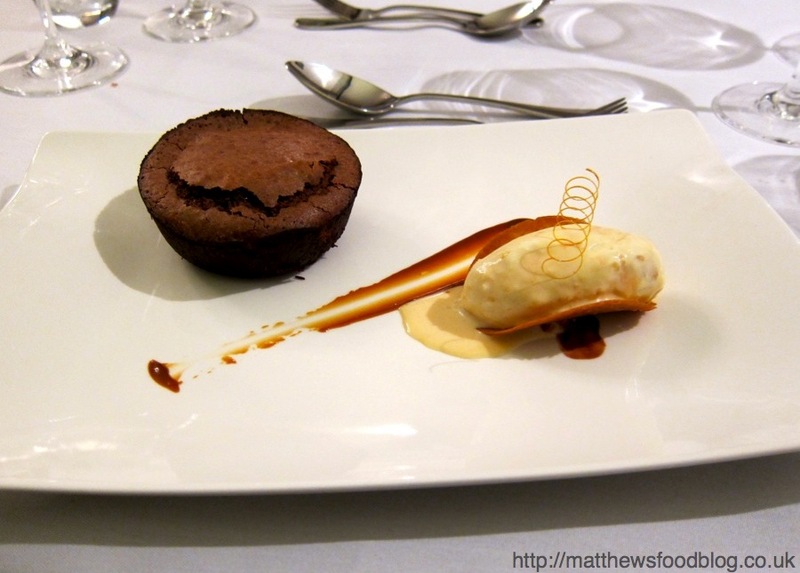 The pastry was great and crisp with your spoon snapping through to the base of the plate with a bang. All three of these elements of the tart made for a great combination, however, with the addition of the cream and the slightest bit of coulis just lifted the entire thing to the next level, you would need to ensure you did not over power the tart with the coulis as this was extremely sweet and took away the sour kick of the lime. After consuming this I can safely say I was full, with this being a particularly filling dish, but being a perfect end to the three courses. Finally served with the bill was a small sweet which was a slice of Devon “Rock”, which is a lovely sweet suckable sweet, it even had the name of the restaurant printed and was a great memento to take home. 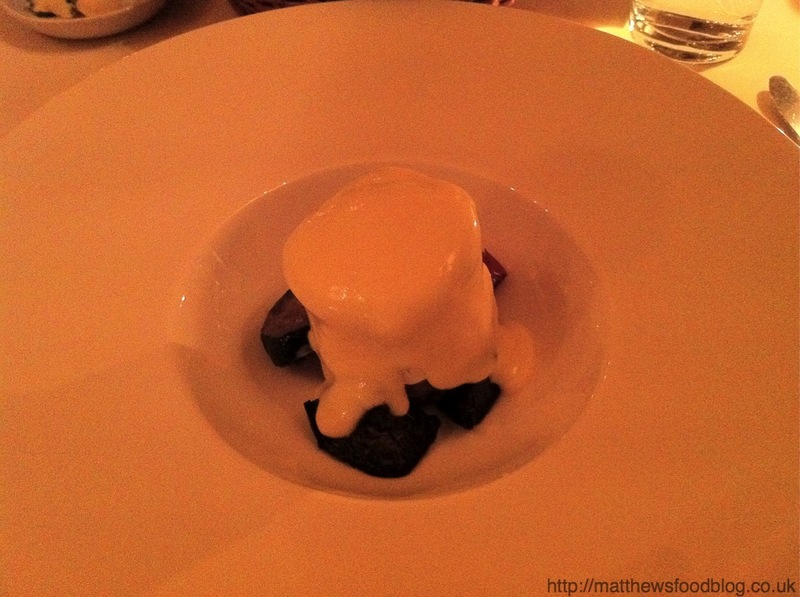 This was a particular favorite meal of mine, with all the elements just blending so well. When thinking back to the meal, not a single dish jumps out at me, and for once they all do! with every dish being a delight to remember. Everything from this evening was great from the relaxed service from the young (and very very attractive) waitresses, to the speed at which everything was served with a good break between the courses as I didnt find myself looking at my watch wondering how long since my last course. The food here was a delight with the starter being the favourite dish of the evening and makes the whole trip of the steep hill worth it. I would love to give this a mark of 10/10 (my first), however the only complaint that comes to mind was the lack of bread at the start of the meal, as this has become a real highlight of visiting Gastro-pubs and sampling some great home cooked bread. I hope this would be changed in the future, and when I next visit would love to find this addition. I would recommend the Cary Arms to my friends and family. I cant wait to return to try their standard menu and will be interested to see how that fares compared to this special set menu. Also for those watching their waistlines, just make sure to park at the top of the hill and not be temped to get a taxi up to the car, as the walk will really help burning off some of those consumed calories!! 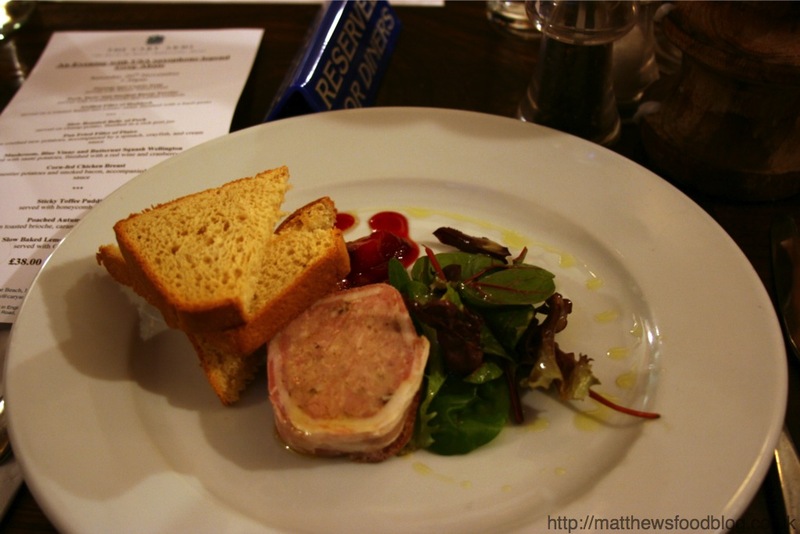 The food is mainly French based with small hints of modern English cuisene from the online sample menu. Also looking through the website I immediately noted pictures of freshly made/baking bread in the oven, for me this immediately shows abit of class when a restaurant make the effort to serve home made bread. This would need to be tested though, as previously seen in other high class establishment this can sometimes be a sin rather than a blessing with some of the poor samples I have experienced of late. 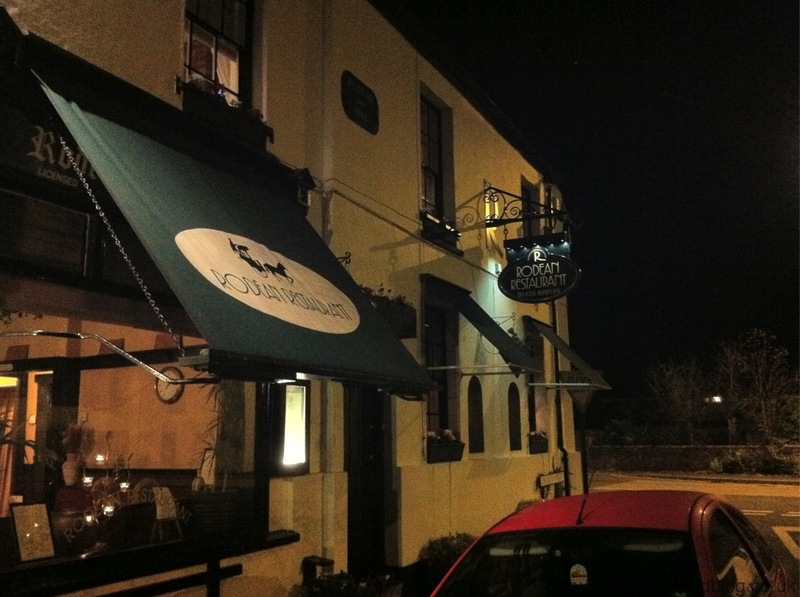 The restaurant is located in the small village of Kenton which is a 10minute drive from Exeter, and easily accessible from the M5, and is on one of the main roads leading to Dawlish. 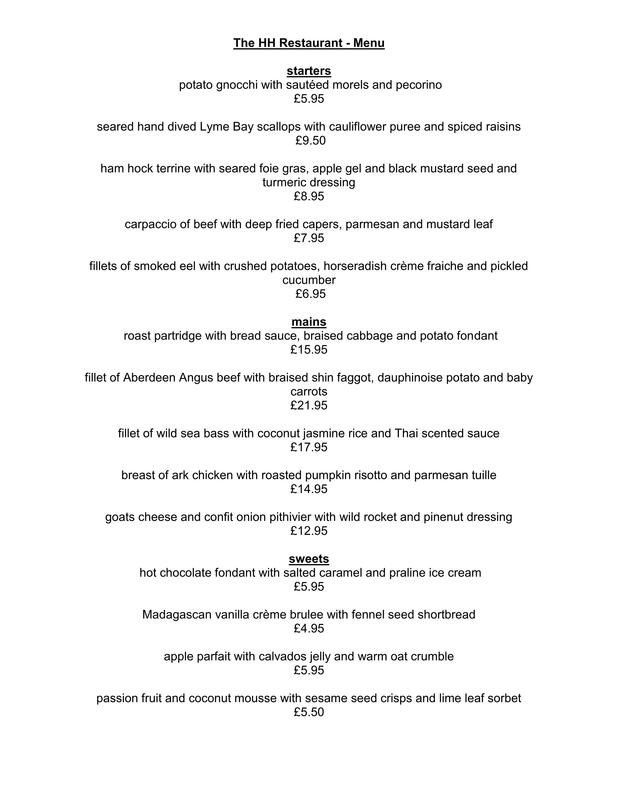 I managed to book the table through their Twitter page, this is becoming more and more common at the moment and is such a easy way to book etc and I do encourage other restaurants to get on Twitter asap to spread updates etc. From the externals, I would immediately pass this due to thinking it was your local “Ale House”, however just turning around the corner from the main road you notice a large glass window showing the internals of the restaurant and dining area. Parking is very easily found with on street and pay and display just opposite the restaurant. Luckily enough arriving at 7:15pm I found parking directly outside the front door which was brilliant as it was extremely cold and frost already starting to form. When entering we were immediately greeted by “lizzie” who is head of front of house, and Matthew Tilt’s (head chef) partner. We were asked if we would like to sit in a small lounge/bar area before going through to our table, we declined the offer of a pre-meal drink due to one of my other dining partners needing to be up early the next morning. We were then led through the dining area, which is extremely dim lit with only a few small wall lights providing a subtle background and the use of candles everywhere. Unfortunately this is a bloggers nightmare as no matter how much you play with camera settings you will get that awful orange tint unless you use artificial lighting and the flash, which I refuse to do in a restaurant, due to other people. So I do apologise now for the poor picture quality which I doubt does do the food justice, however my nice new DSL c/w Macro lens its winging its way on Santa’s Sled so not long to go. Lizzie was very talkative and instantly put you at ease considering we were the only diners in the main restaurant area, and had a good chat about general life. During chatting the other out of house waitress brought to our table a small pot of olives and took our drink orders. Within minutes our drinks were placed onto the table and menus handed out. The small olives which were slightly different than you average fare, were black and already pitted and soaking in what seemed a very sweet chutney/oil based chutney. These were lovely and soft and extremely sweet with a light kick of chilli towards the end, and a great way to start the meal. Looking through the menu’s you are offered the “House” menu which had offers such as “3 courses for £19” which on first glance seemed great value for money. Having seen the A La Carte though we all decided to go for this choice, having such great diversity and different combinations on offer. I noticed on the base on the menu that the chef is also advertising the restaurants twitter account, which I hope means in the future they will have some great offers and maybe some theme nights coming up. Lizzie soon returned to take our orders and again was a great highlight to the calm dining room which at this time only had 1 other couple who had now been seated. 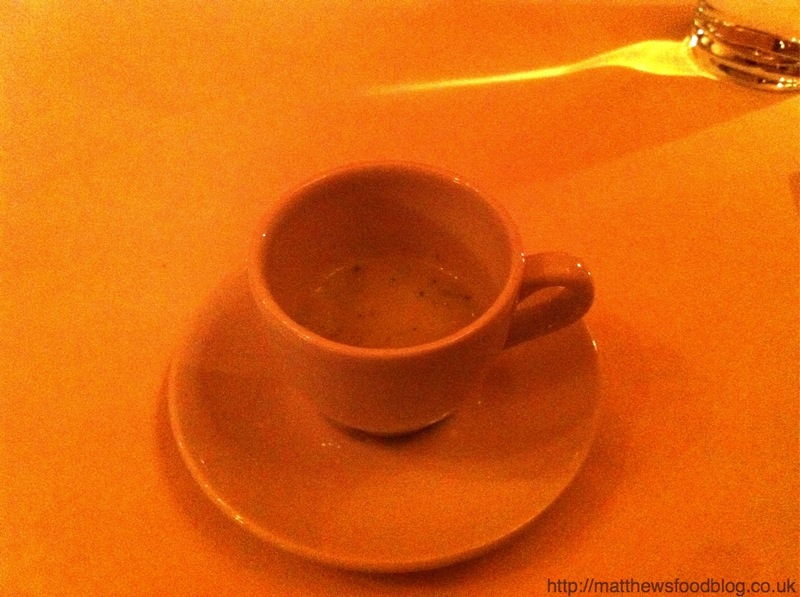 With starters and mains ordered, soon appeared a small “Amuse Bouche” of Broccoli and Blue Cheese Soup, this was extremely thick and for the more lady like diners, maybe a spoon could be a useful addition. This had a deep strong flavour of blue cheese, but this was not overpowering due to the subtle flavours of the broccoli calming the flavour, and with the use of good seasoning was a brilliant start to the meal. The table was then quickly cleared, the front of house are very good at being out of sight yet still knowing everything that is happening within the room, they stay within the bar area but are forever keeping a keen eye on the diners through the small walkway, this works well and due to the small area if they were based in the room it would be abit too much. A few moments went by and a sense of worry was quickly dawning that no bread was in sight!, now having followed the head chef on twitter for a while, I was always very amazed by the large amount of different bread he is constantly baking and posting photos etc and was getting more and more worried that this would not appear….. 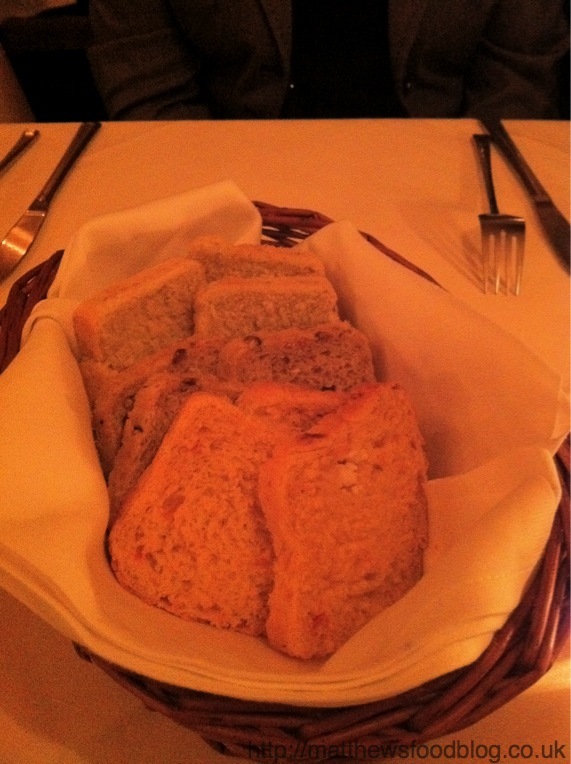 However these worries were short lived as the waitress then appeared with a wonderful basket of homemade bread complete with a small plate of butters. A large sigh was released when these did appear and I was thankful I had built my hopes up regarding this. Granary – Lovely and served warm this bread very dense and had a great chew yet still being light to eat and not like a heavy stone hitting your stomach, the crust were not crusty and instead chewy which I love for my granary bread. Pesto – This lightly green tinted bread was sampled next, again this was so fresh and warm it was excellent with the pesto flavour being subtle but still evident. Sun Brushed Tomato – This was the star of the offering with the crust being crunchy to eat and a particular highlight, this red tinted bread was the best on offer with the strong tomato flavours exploding in your mouth and partnering lovely with the butter. I found the chopped chives worked brilliantly with the granary and I quickly used the whole amount of this one on my single slice and was brilliant. If I could base the score of this meal on the bread alone it be an instant 11/10, and the bread is easily on par with the “Walnut and Raisin” bread I sampled at “The Square – London” a few months back. I only wish Matthew Tilt could mail order this stuff as I would be first in Line. Unfortunately however I will note that when the bread was served the starters were then served, within the next 2 minutes so myself and my other diners had not enough chance to even butter our first slice by the time our starters were served. This made for the bread experience to be abit downgraded as the flavours of these beautiful loafs need to shine for them selves and would have liked abit more time between this course. 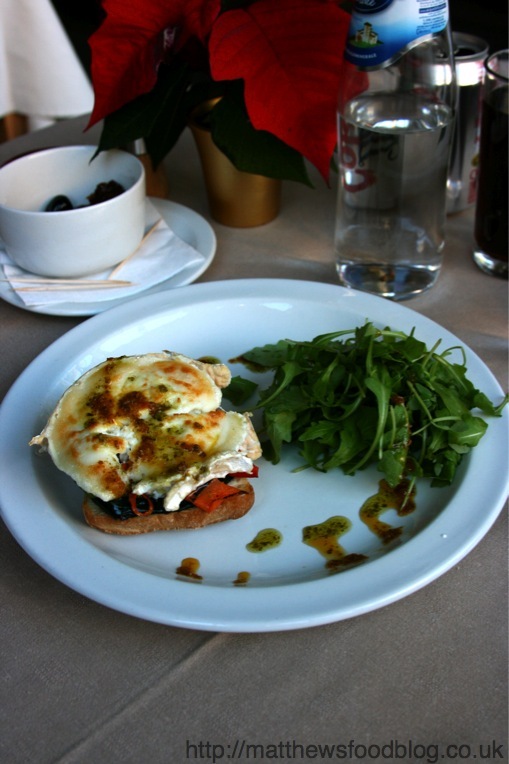 Starter – Warm Goats Cheese & Hollandaise Sauce, Resting on balsamic roasted vegetables. Normally I will very rarely go for a starter which does not have a meat element, I do not know why this is but I will always tend to go for a duck/pork starter for no apparent reason other than my brain being lured by crispy cracking etc. This evening though I went with a firm purpose of trying something different to start with and I can happily say I will be doing this again!. The dish looked great with the pale goats cheese which was a large stacked portion, which was smothered in sauce and resting on a small toasted piece of bread with the vegetables placed around. The goats cheese was great and smooth to cut, and when placed in the mouth it was just warm and incredibly dense, at first I was slightly worried about the richness of this, however due to the acid in the balsamic vegetables and the hollandaise sauce having a strong base of lemon, it worked brilliant to cut through this rich cheese and was some of the best I have sampled. The vegetables were a mix of onions and aubergine and still had a good crunch, which combined with the good crunch of the bread on the base added a great change of texture which the clogging cheese can cause. This dish however was incredibly filling but was worth it as the flavours were brilliant and strong. 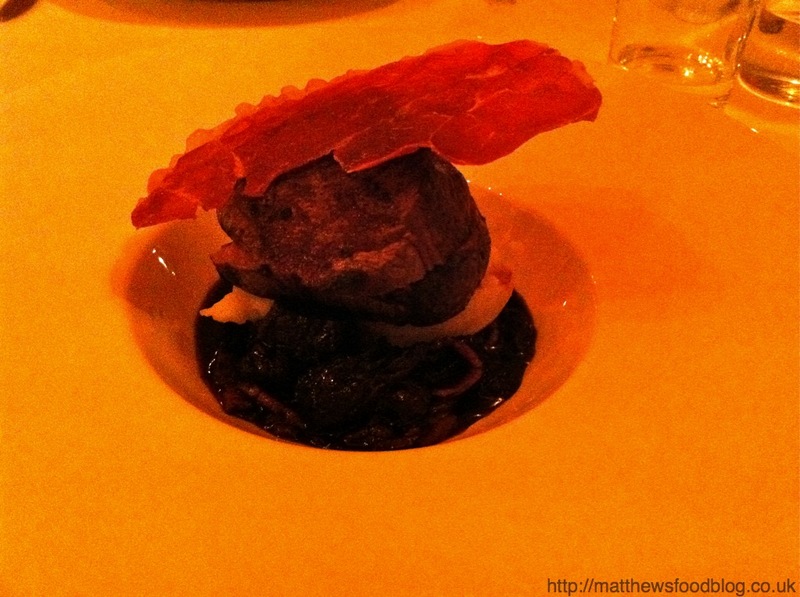 Main – English Beef Fillet & Beef Bourguignon with Lavender scented creme potato with Pancetta & Morels. 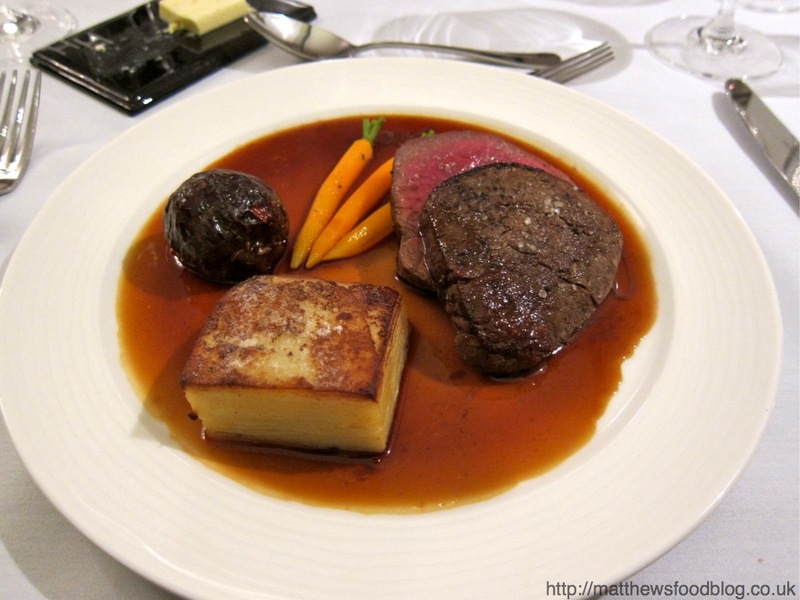 The presentation of this dish was superb with the large fillet placed on a small mound of creamed potato with the beef bourguignon placed around the sides. Firstly I sampled the brilliant and crisp pancetta which was so brittle it was hard to pick up, this had a lovely salty taste and provided an almost crackling flavour with the hint of dense fat. The beef fillet itself was large and sliced directly through the centre horizontally which when moved showed the lovely perfectly cooked rare meat, this was very tender and provided good taste. The creamed potato was slightly disappointing due to the lack of flavour however this was due to the incredibly strong powered bourguignon, which had an incredible flavour with chunks of beef that just melted on the tongue. Due to the use of Pancetta/bacon again this did have a very strong salt flavour which unless paired with the potato would have been overpowering. This was a great dish with everything cooked excellent and I truly find it hard to find fault with any element, the only thing that comes to mind is the dish which it was served in made for cutting the meat quite difficult and a slightly shallower bowl would have been more convenient, however this is really trying to find fault. 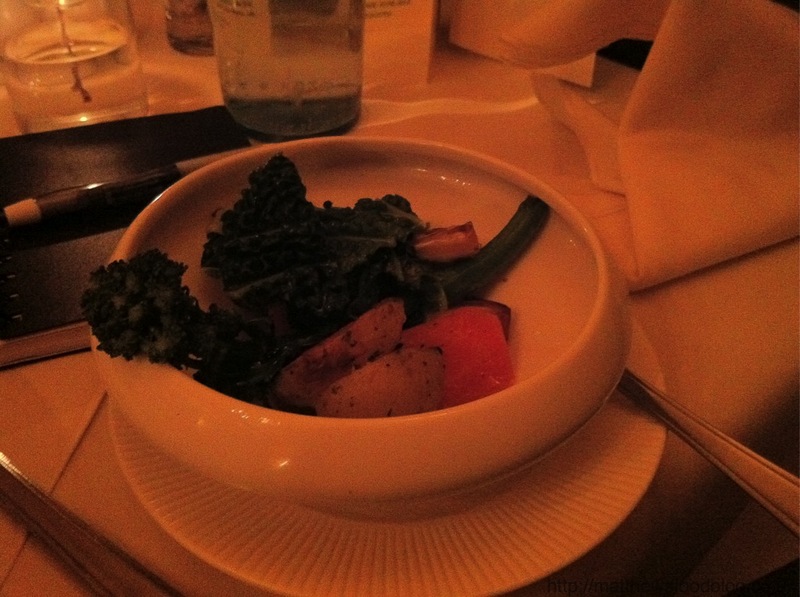 Also vegetables and more starch was served in a side dish if the potato on the plate was not enough!. The vegetables were great with good flavour and although I didnt sample the new potato’s and sweet potato was told by my other diners were great. 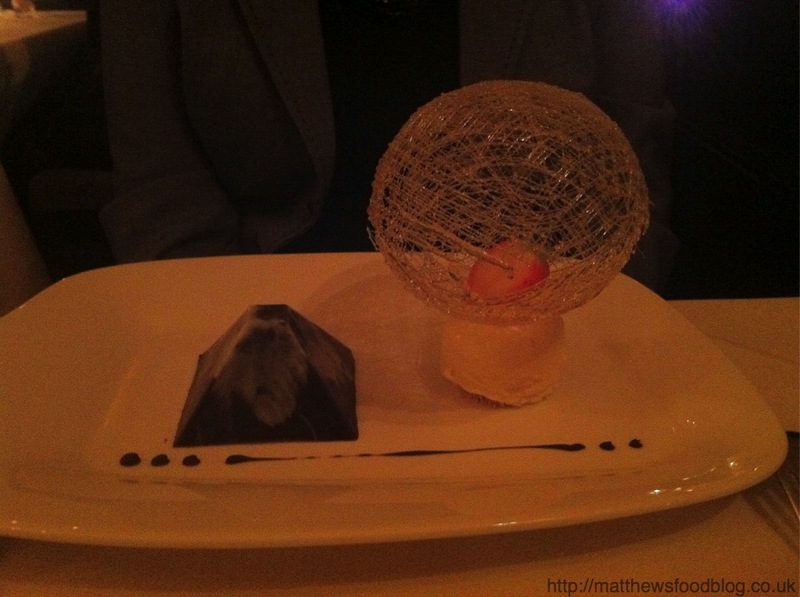 Dessert – Chocolate Two Ways, Chocolate Pyramid filled with a dark chocolate mousse, with Homemade chocolate ice cream. When this dish was served this is one of the most dramatic use of sugar art ive seen and when the waitress was walking to the table, it instantly caught everyone eyes with small whispers are aspiration at this stunning looking dish. When placed in front of me I was stunned with just not knowing where to start with everything looking pristine on the plate, the sugar art globe which was made from 2 half’s I quickly dismantled and sampled, it had a lovely toffee apple taste which will bring back your child hood memories. The ice cream which lay below was sitting on a small base of shortbread/biscuit and had a great texture with small lumps of biscuit spread throughout, this had a great flavour, however the chocolate didn’t come through as strong as I had thought but when looking at the pyramid placed next to it I think I can understand the reason for a subtle flavour. The pyramid which at first glance I thought was just a moose with alot of gelatin used to allow such a wonderful mould, I was soon impressed to find this was a true solid chocolate pyramid which upon cracking revealed a thick chocolate moose. The pyramid it self had a very strong flavour due to the dark chocolate used and complimented great with the ice cream and sugar. The moose it self I think was a mix of Milk and Dark as the flavour had a great sweetness to it and lacked the bitter tastes normally found in high percentage dark chocolate. 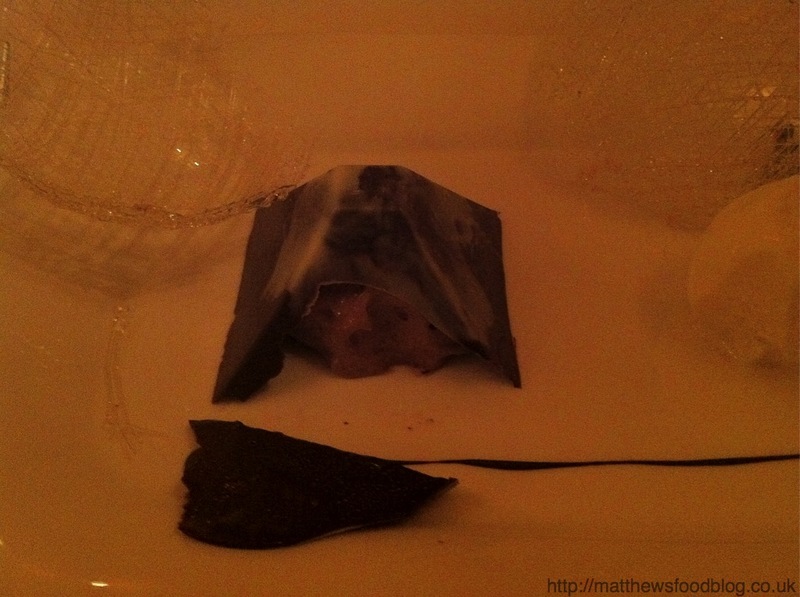 Overall this is the most striking dish visually ive sampled of late and was a great end to the meal. Now unfortunately due to being 3 diners I could not sample the lemon tart due to diner A quickly taking that, diner B being quite full settled for the chocolate truffle and allowed me to sample the remainder and the caramel tart. 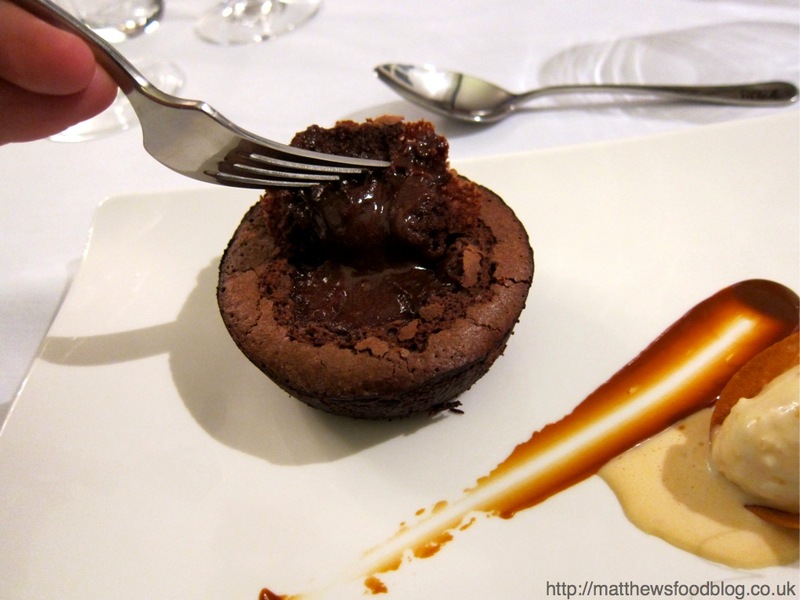 The chocolate was great with a crisp external and deep chocolate truffle ganache inside. The caramel was also good with a good base of pastry and small biscuit shards placed on top. 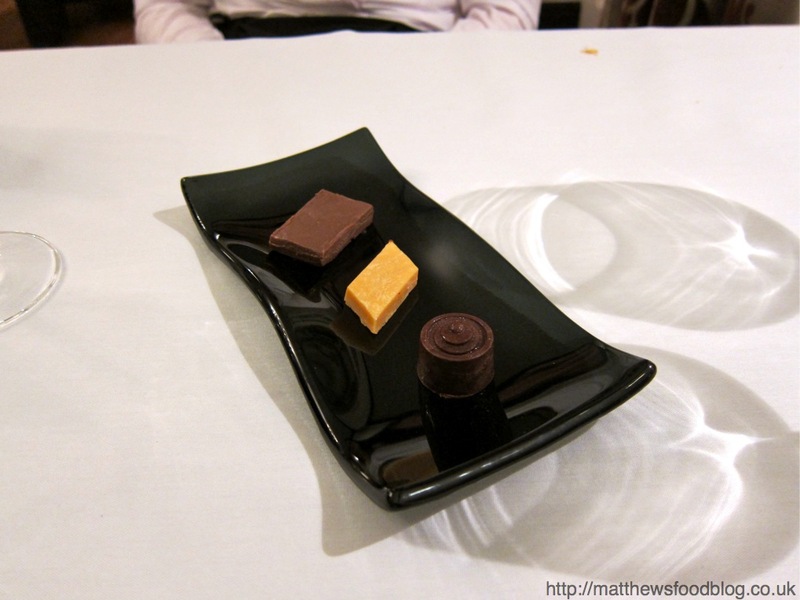 I would like to see 3 of each petit four’s served as this would allow all diners the chance to sample them, and this is normally what I would expect. 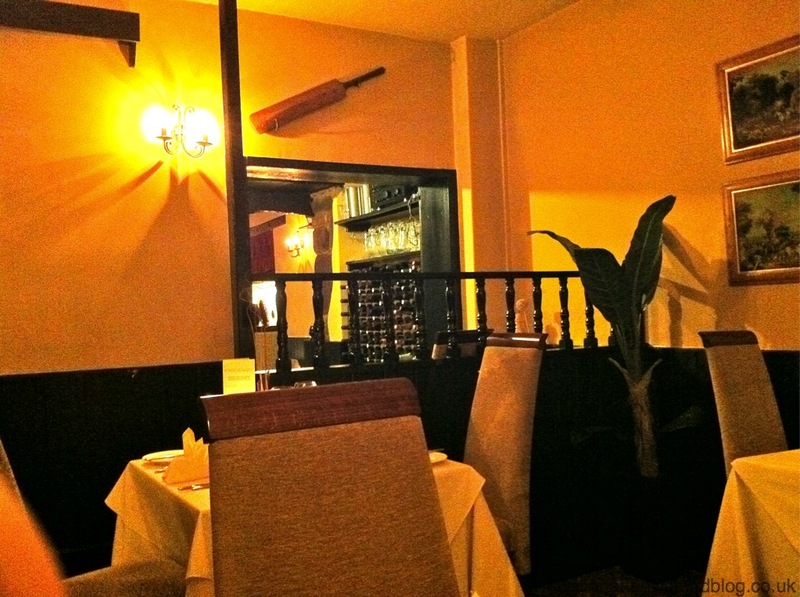 This was a great meal with some excellent service, brilliant food and set in a great location for a good price. I was pleasantly surprised with this as I was not expecting such high class food from such an unheard of place. It is difficult to find any major faults at all, with only small niggles remaining such as the lack of time to sample the bread and the serving of only 4 petit fours between 3 people not allowing us all to sample. These are such minor things though and don’t detract at all from the overall experience. I would recommend this place for anyone who wishes to spend a lovely evening with their partner in a romantic environment and also for any celebration. If you can try and sneak out a loaf of bread when you go as I wish I did!!! (Yes I did think the bread was that good!!). Hopefully I will be returning for one of their 5 course dinner nights shortly.